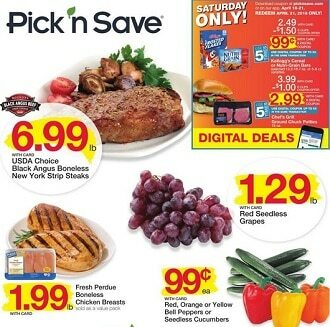 Here is the Pick N Save Ad, valid April 17 – April 23, 2019. Don’t miss the Pick N Save specials, printable coupons and grocery deals from the current Ad Circular. Save on fresh foods including Kemps Premium Ice Cream, Fresh Lean Ground Chuck, Ocean Spray Cranberry Sauce, Bradshaw Bakeware, Brownberry Wide Pan Bread, Tropicana or Simply Juice, Hefty Trash Bags, Ore-Ida Potatoes, Sugardale Half Ham, Chiquita Jumbo Pineapple, Starbucks Coffee, Simple Truth Organic Groceries, and more.